Arriving in Cairo for another thrilling excavation season, Amelia is relaxing in a well-earned bubble bath in her elegant hotel suite in Cairo, when a man with knife protruding from his back staggers into the bath chamber and utters a single word—"Murder"—before collapsing on the tiled floor, dead. Among the few possessions he carried was a sheet of paper with Amelia’s name and room number, and a curious piece of pasteboard the size of a calling card bearing one word: "Judas." Most peculiarly, the stranger was wearing a gold-rimmed monocle in his left eye. It quickly becomes apparent that someone saved Amelia from a would-be assassin—someone who is keeping a careful eye on the intrepid Englishwoman. Discovering a terse note clearly meant for Emerson—Where were you? "—pushed under their door, there can be only one answer: the brilliant master of disguise, Sethos. Joan Hess was the author of the Claire Malloy Mysteries and the Arly Hanks Mysteries, formally known as the Maggody Mysteries. She was a winner of the American Mystery Award and the Agatha Award (for which she was nominated five times), a member of Sisters in Crime, and a former president of the American Crime Writers League. 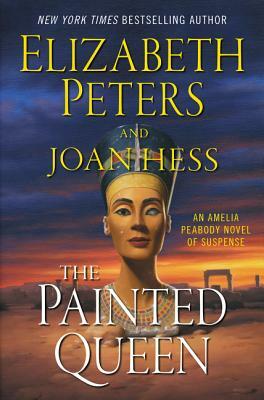 She died in November 2017, four months after the publication of The Painted Queen.